First off, I have an email address now, feel free to message me with any thoughts about the project or contributions which you’d prefer not to share publicly. 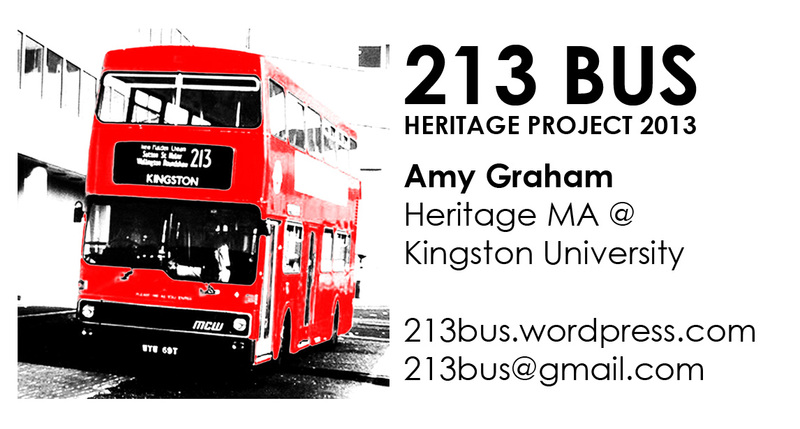 It’s 213bus@gmail.com! This blog is a bit more about my project rather than specifically about buses or local history. I’m completing this project as part of a Masters degree called ‘Heritage (Contemporary Practice)’ at Kingston University. Instead of doing a traditional dissertation I have chosen to do this, a creative project. There are three elements which I will be assessed on: a 5000 word essay, a journal (this blog) and a creative outcome. Initially, I thought that my creative outcome or proposal should be a local history exhibition. I’m still exploring if this will be possible but in the meantime I want to keep my options open and have come up with a few other ideas: a 213 festival (events programme, heritage bus, gingerbread buses! ), a historic bus tour (seems appropriate, travelling on an old 213), or a group of walking tours (with guide to the local history). Which is your favourite? Any other suggestions? As well as photographing the stops, I was also on the look out for interesting things to research. I could look into the design of stops themselves, Lindsay Road has a new shelter because an old tree feel on top of the last one, and I must say it is absolutely rubbish! Way too tall that is doesn’t actually function as a shelter either from wind, rain or sunshine! Or maybe look into the history of pubs on the route: today I passed the North End Tavern and the Worcester Park (boarded up). Other interesting things: churches, F W Paine funeral directors, Police station, interconnection between railway and bus route, interconnection of different bus routes, Manor Park Recreation Ground, ‘Roadstar’ art piece….. Lots of possibilities! I then came back and designed a business card. Have you guys got any good suggestions of where I can print it without excessive postal charges? I also made up a postcard/flyer thing which I’m thinking of getting printed as a way to start collecting other people’s thoughts, memories and experiences….A lot to think about, a lot to do!